Frequency range: 10 Hz - 1 kHz,sensitivity relative meet ISO 2954. - Application Text : These meters can be widely used in environment, ocean and flying industries, etc. With a focus on the ever-evolving demands of our customers, we have come up with a wide range of Digital Anemometer. 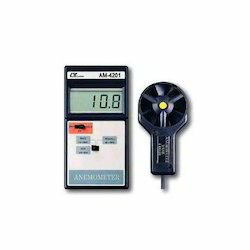 UT363 anemometer is a mini wind speed and wind temperature tester. This light weight device is equipped with the latest magnetic sensing technology which can directly display the air flow speed on the LCD display. It is a perfect tool for sport events, wind measurement, navigation, HVAC, and other areas. 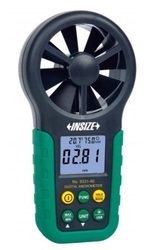 Product Description With its handy format, pocket sized vane anemometer testo 410-2 is extremely suitable for fast check measurements at ventilation grilles and outdoors. With the permanently installed vane (diameter 40 mm), you can even measure low air velocities from 0.4 m/s to 20 m/s. Available in Range 0.4- 30 m/s, km/h & ft/min. Knots and Air Temprature.